Your mug purchase helps us to purchase more stainless to make more beer in! Craft beer has recently come under attack by big beer and along with other forces. With this in mind we at Brigadoon Brewery can no longer stand ideally in the mist of time while our craft beer friends fight alone. For the love of good craft beer and in support of our fellow brewers Brigadoon Brewery is embarking on a Craft Beer Crusade! To begin this Craft Beer Crusade we will need to establish a year round real world brewing operation. To do this will take money and help from our loyal followers. 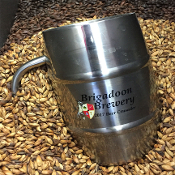 Being proud and Scottish we will not beg for money but we will offer you a way to assist us by purchasing the Craft Beer Crusader mug! This Craft Beer Crusader mug is made with a durable double wall construction, these stainless steel mugs are elegant drinkware items designed to take a hit or drop without shattering. The inner wall features a brushed finish, and they hold up to 17 ounces of your special beverage. Barrel shaped, they feature a smooth outer wall and tube handle for strong grip, just the thing needed to protect your ale as you assist in this crusade. These mugs bear our dragon which means they are part of our Dragon Mug Club! Which means that you not only are supporting startup of our new second location but you will also be able to experience the same club benefits you have come to enjoy at our Texas Renaissance Festival location. Don’t wait as we only have a limited number of these special release mugs and Charter Memberships available.